Is Hillary Still the Front-Runner? Senator Hillary Clinton (D-NY) speaks about her trip last week to Iraq and Afghanistan during a news conference in the Capitol in Washington January 17, 2007. 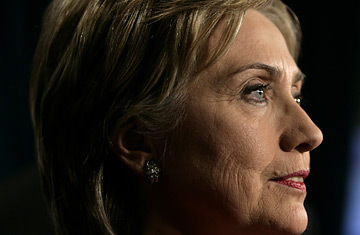 Hillary Clinton's announcement that she is forming a presidential exploratory committee is the least surprising news of the 2008 campaign cycle so far. Her 2006 Senate re-election campaign, which she won by 30 points, was a test run, in which she built the fundraising machinery and other infrastructure for a national bid. But the dynamic of the race is very different than it was even six or eight months ago, and the challenges she faces have shifted. That shows in the early polls in Iowa and New Hampshire, which are far tighter than anyone might have expected. Clinton enters the race the presumed front-runner. But where it once was assumed she would be vulnerable from the right in a Democratic primary, it now appears that her support for the Iraq invasion will require her to worry more about her left flank. Where the greatest question she expected to face was about whether a figure as polarizing as she is could possibly be electable, it could now be whether she is polarizing enough to appeal to primary voters who are looking to express their own anger. Even the excitement factor  the prospect of being the first woman President  has been blunted by the fact that her leading challenger, Barack Obama, could be the first African-American one. What's more, Clinton is hardly a fresh face. By 2008, voters will have lived for two decades with either a Clinton or a Bush in the White House, and polls  including TIME's  show they are growing uncomfortable with the idea of American dynasties. Still, she enters the race with two assets no other contender can match at this early point: near universal name identification and the best money-raising operation imaginable. Her style on the stump is often dull and cautious, but the flip side of that is she rarely makes mistakes. Nothing beats having actually done it before, and she has had the experience of having lived through two successful presidential campaigns. And then there's Bill, who will be both blessing and baggage. One of the most interesting things will be watching how her campaign deals with a former President in the role of campaign spouse. If he stands next to her on stage, he overpowers her. If he campaigns alone on her behalf  the traditional "surrogate" role in which many spouses are most effective  it will likely appear that he is running for what is essentially his own third term. And if he stays out of sight? Voters start wondering again just what exactly is the deal with their marriage. Ultimately, however, the question is whether voters' views of Hillary Clinton are so set that they cannot give her a second look. Can she win in November 2008? Her strategists point out that all she would have to do is pick up every state that John Kerry did, plus one. But getting the nomination looks far more complicated than it once did.